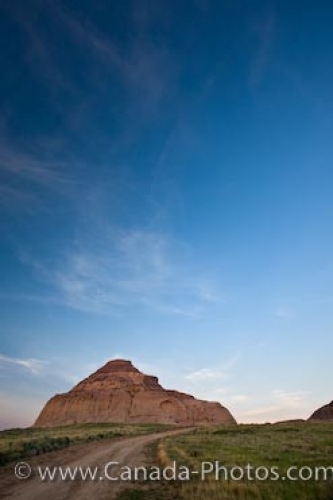 The bright blue hues and thin wisps of clouds span the sky at sunset over the gravel road and Castle Butte in the Big Muddy Badlands in Southern Saskatchewan, Canada. Castle Butte, a unique landmark formation located in the Big Muddy Badlands in Saskatchewan, Canada is highlighted by the vibrant blue hues at sunset. The gravel road leading to Castle Butte surrounded by barren prairie landscape, is easily accessed from Highway 34. In early years, Castle Butte was a prime navigational tool used by both the good and bad. Over time, the weather has formed this mixture of sandstone and clay, creating the shape and design of Castle Butte which visitors to the Big Muddy Badlands see today. Road leading to Castle Butte during sunset in the Big Muddy Badlands, Southern Saskatchewan, Canada. Picture of a sunset from the road to Castle Butte in the Big Muddy Badlands in Saskatchewan.